The SV1 is a new stage piano that looks to the past. PRESS RELEASE: The name pretty much says it all. The SV-1 Stage Vintage Piano offers the most rewarding compendium of electro-mechanical, transistorized, tape-driven, analog, and early digital keyboards ever available in a single instrument. Crafted using Korg's RX (Real eXperience) Technology; each sound is a detailed and authentic re-creation, accurately capturing the full range of expression and dynamics of the original. But for Korg, even that is not enough. The SV-1 also provides access to the effect pedals, amplifiers, speaker cabinets and studio techniques that gave these sounds their original lustre. Together, they provide fingertip access to the sounds that defined generations of popular keyboard playing. Designed with performance in mind, the SV-1 is a pleasure to play. Once you try it, you'll understand what all the excitement is about. The RH3 Real Weighted Hammer Action is the finest keybed Korg offers, with a solid, responsive feel that inspires confidence. Forget menus. Never mind banks and programs. Stop staring at displays. With the SV-1, the entire front panel is always live, using clearly labelled knobs to dial up just the sound you are looking for. Saving your eight Favorite settings for quick recall is as easy as saving a station on your car radio. The 36 sounds in the SV-1 span from electric pianos, acoustic pianos, organs, strings and synth. Each category of instrument starts with the essential classics and then moves beyond what other products offer, going into some rare and unique instruments that were the part of the soundtrack of their eras. So the electric pianos start with a seven-way velocity switched "tine" version, continue through the classic "reed" based model and then into a vintage analog "electra" instrument (all from American manufacturers), as well as two different Japanese mid-80's digital classics. The acoustic pianos include three-way stereo versions of both German and Japanese grand piano giants, a more intimate upright piano, a much-needed mono piano for small gigs, a late '70s-mid 80's Japanese electro-acoustic variation, plus some blended sounds. Organs include three variations of the classic tonewheel model, plus the most famous British and Italian combo organs, along with the first known offering of a signature American tube-driven console organ. Each of the core instruments has been accurately sampled including tine, key-off, damper and hammer noises at different velocities. We even sampled piano cabinet resonances to enhance the accuracy of our pianos. This attention to detail, called the RX Experience, is what makes playing the SV-1 a joy. It comes to life under your hands, with a three-dimensional sound evoking the electro-mechanical legends, reborn. A wealth of amp heads and speaker cabinets are available to add colour, drive and edge to your sound. Plus, Korg's exclusive Valve Reactor circuitry adds the warmth or snarl that only a real tube can provide. The user interface has been designed with performance in mind; every essential control is quickly accessible on the front panel, with no confusing menus or multiple button presses. Rotary knobs include illuminated LED's to show the position of the knob, and can be pressed to restore the original setting. For really quick changes, the SV-1 has eight car-radio style buttons to instantly call up your eight Favorite sounds and settings. Storing a Favorite is equally as easy. Simply adjust the controls to your preferred settings, then press and hold one of the Favorites buttons; when the button flashes, press it again and the settings are now stored. 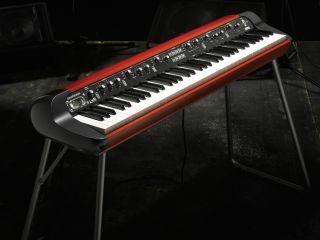 The SV-1 is equipped with Korg's finest graded-hammer action (RH3) keyboard on both the 73-key and 88-key versions. The FUNCTION button provides access to eight different tuning curves including equal, grand piano stretch, electric piano stretch, electric grand, upright stretch, detuned and two user-definable types (configurable using the editor/librarian software). Overall tuning can also be accessed via the FUNCTION button, and adjusted by using the EQ treble control. While in this mode, concert pitch (A=440) can be recalled quickly by pressing the treble encoder pot. Needless to say, the SV-1 can be transposed into any key. Housed in a bold, curvaceous body, the SV-1 really stands out from the crowd. Coupled with retro-style controls and stunning metallic red (73-key) or carbon grey (88-key) finishes, the SV-1 oozes desirability - and playability! An optional adjustable and collapsible chrome stand is available, along with a gig-ready rolling soft case. A pro keyboard would be incomplete without all the right connections. The SV-1 is equipped with balanced XLR and ¼" outputs; Left and Right audio inputs; MIDI In and MIDI out jacks, USB MIDI Port, and 3 pedal connections: Damper, Pedal 1, and Pedal 2. The Damper pedal is included, and responds to half-pedaling for authentic piano response. Pedal 1 is designed for a switch type of pedal, and can operate as a piano Sustenuto pedal, or as a Fast/Slow switch when the Rotary Speaker effect is on. Pedal 2 can accept either a sweep-type pedal - great for authentic Wah effects - or an additional switch pedal, providing the piano purist with access to all three piano pedal functions by adding the Una Chorda (soft) function. While setting out to create an incredibly friendly and easy-to-use instrument, we knew that there were more tech-savvy players out there that would love nothing more than to dig in a little deeper. The SV-1 Editor/Librarian software provides cool graphic-based programming, including access to certain parameters not available on the SV-1's panel. In addition, the Editor/Librarian software allows each of the 36 sounds and the eight Favorites to be programmed and saved individually. This points the way to users sharing and swapping their favorite settings, and for Korg to supply more sounds in the future. The SV-1 Editor/Librarian runs on Mac or PC, and is included free with every SV-1. A separate stand and carrying case are available as optional extras on the SV-1.